When we say tech, what do you first think of? Young men squirreling away in a dark room surrounded by half eaten pizzas, lit only by flickering lines of code – an army of wannabe Mark Zuckerbergs on a mission to develop the newest product which will make them millions? Or a woman? For the majority of us, the first image springs to mind – sort of understandably. After peaking in 1991 at 36 percent, the number of women in computing roles has decreased to 25 %. Gender ratios are as low as 1 female to every 4 male engineers in top tech companies like Google. Women only hold 11 % of executive positions in Silicon Valley companies. And things aren’t looking up – especially when women receive lower salary offers than men for the same job at the same company 63% of the time and their earnings are on average 29% less. All this is despite women leading the way right at the beginning of tech as we know it: Ada Lovelace was the first computer programmer back in the 1840s, Hedy Lamarr invented frequency-hopping technology to help avoid the threat of blocking radio signals during the Second World War, and in 1952 Rear Admiral Grace Hopper created one of the world’s first compilers and her programming language design work led to the creation of COBOL (common business-oriented language) which is still used to this day. So, what happened – what’s holding back all the Lovelace 2.0s? There isn’t a straightforward answer, nor a straightforward solution. An internal study by HP found women are only likely to apply for jobs for which they are 100% qualified, compared to men applying for ones when they only hold 40% of the qualifications. In fields such as tech, where the general view is that it’s complicated and difficult to understand, women’s lack of confidence in putting themselves out there and taking a risk could be more common. Couple this with the stereotype at the beginning of this article, and you get an industry lacking in clear role models for women of all ages to aspire to which could boost confidence and encourage them to apply for roles in which they could possibly excel. Not ideal. Enacting this change to create a more gender-equal industry is not just a case of ticking the diversity box – studies have shown that a more diverse workforce is more productive and innovative especially for tech. In the case of products developed and tested solely by men, there is an intrinsic gender bias literally programmed into it – creating products such as voice recognition software that struggles to recognise women’s voices. As complicated algorithms become greater parts of our daily lives as we steam-roll into the fourth industrial revolution and rely more on human-coded AI, rounded and fully-representative development teams are essential. It’s not all bad news, though. All female support networks and networking sites dedicated to providing platforms for women in tech have sprung up in both the virtual and physical world, and it’s this outpouring of support and a dedication to profiling role models in the sector which can drive the change needed to increase female participation. 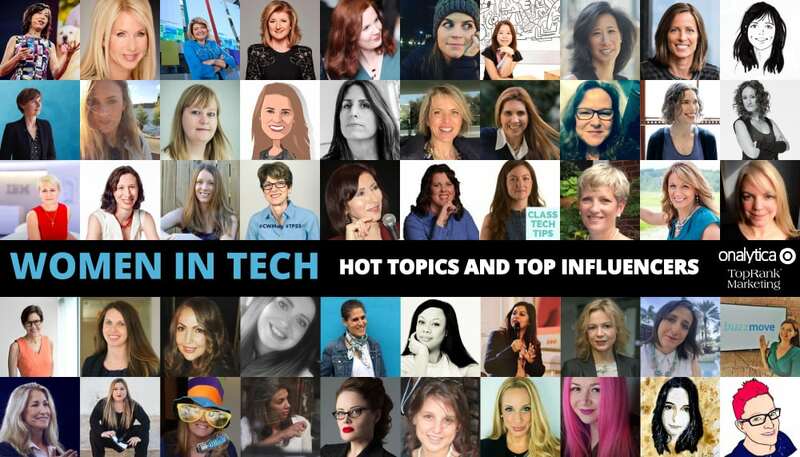 So, in partnership with long-established digital marketing leaders TopRank Marketing we’ve compiled a few lists of the most influential women in top tech topics for you to get inspired! 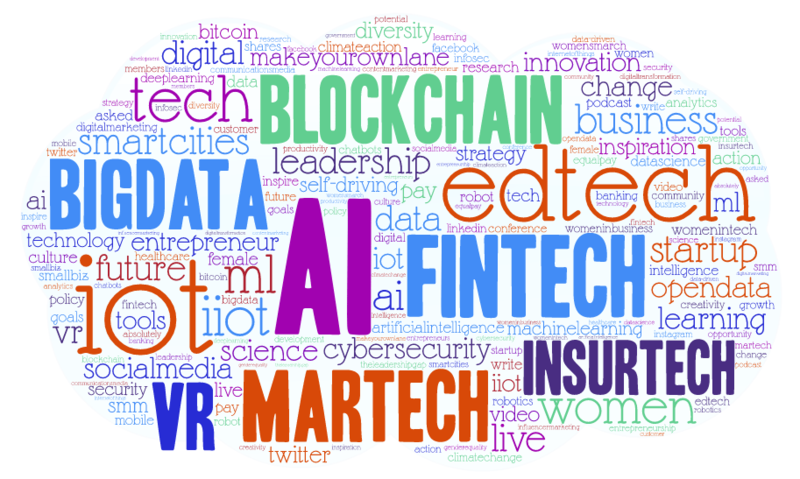 The most frequently mentioned topics by the top women in tech influencers were: Artificial Intelligence, FinTech, Blockchain, BigData, IoT, EdTech, MarTech, InsurTech, Virtual Reality, Cyber Security. We decided to delve into these topics further to uncover the top influencers in each area. Below is a list of the top 25 female influencers discussing artificial intelligence. If you want to see who ranks from 1-50 be sure to download the full report by clicking the download button below! Below is a list of the top 25 female influencers discussing big data. If you want to see who ranks from 1-50 be sure to download the full report by clicking the download button below! 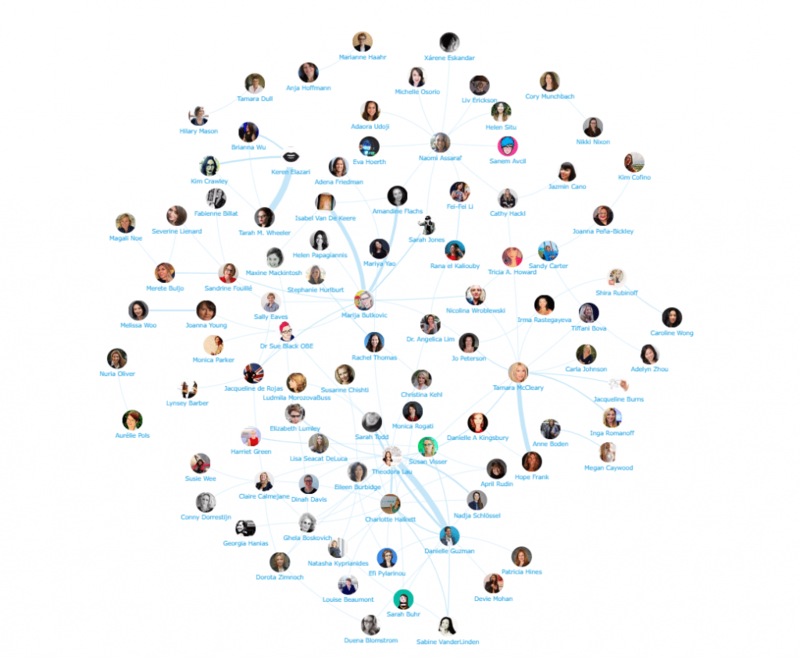 Below you can see a network map of the online #WomenInTech conversation. This map was created with our Influencer Relationship Management software (IRM). Be sure to click on the map to enjoy the full size network diagram in greater detail. Below is a list of the top 25 female influencers discussing edtech. If you want to see who ranks from 1-50 be sure to download the full report by clicking the download button below! Below is a list of the top 25 female influencers discussing Virtual Reality. If you want to see who ranks from 1-50 be sure to download the full report by clicking the download button below! Disclaimer: As ever with these lists, it must be stressed that the ranking is by no means a definitive measurement of influence, as there is no such thing. The brands and individuals listed are undoubtedly influential when it comes to driving discussion around Women in Tech. Lizzie is a dedicated Insights Analyst at Onalytica working on in-depth research & analysis projects identifying actionable influencer insights for our top strategic clients including Tech, Electronics, Energy & Environment. 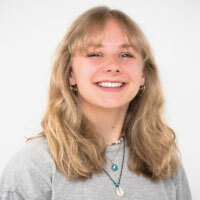 Prior to Onalytica Lizzie worked as a Social Media Community manager for Ethopiaid and has a 1st class honours BA in Anthropology from the University of Bristol.